Melody Scanner - Automatic Music Transcription App! GIVE MUSIC YOUR PERSONAL NOTE! 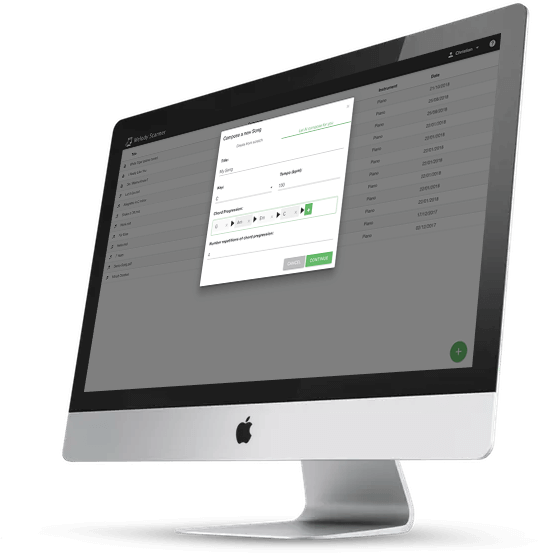 Melody Scanner is the most powerful tool to automatically transcribe your favorite songs to sheet music. No installation required — use the app directly in your browser! 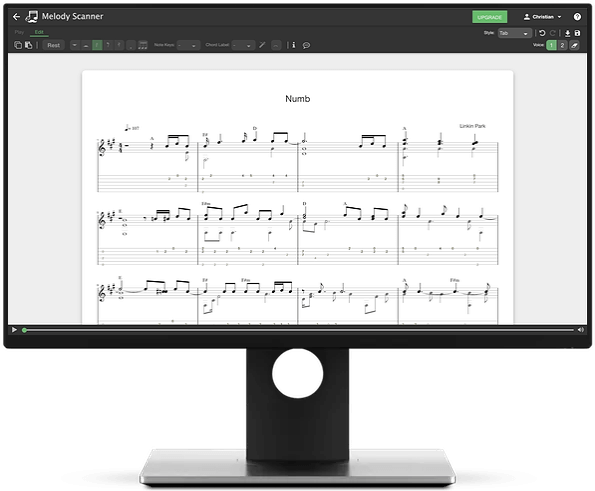 Bring your compositions to paper on the easiest way possible. Generate scores by recording your playing. 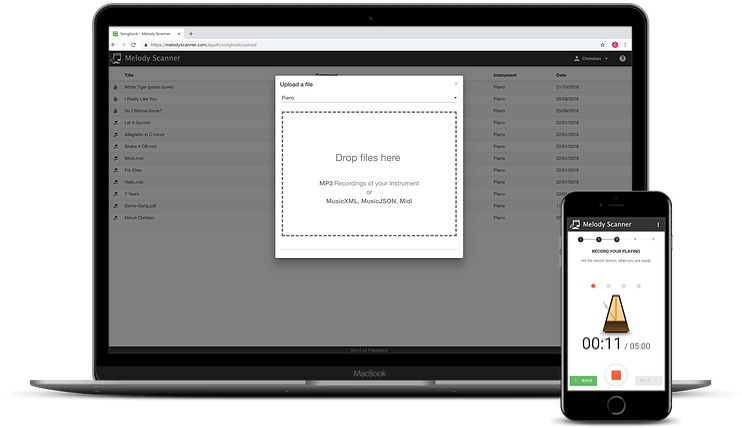 Import Midi, MusicXML, or even MP3 files to your personal cloud songbook and access it from any device. Use our YouTube to Score feature to automatically generate sheet music from YouTube videos. Edit scores the way you want. There are three view types available between which you can switch. Finished with editing? Use the PDF export to create beautiful sheets. Edit sheet music as you know it from other software, but all that in your browser. Have your scores always with you. A colorful alternative especially for pianists. Connect a midi keyboard and make it the most intuitive way to edit scores. As a guitar player you might prefer creating tabs instead. Go for it and simply display the tabs below the classical notes. Our engineers develop handcrafted algorithms for every supported instrument. This passion combined with our research in artificial intelligence makes Melody Scanner a powerful tool and leads to great transcription results. Currently only solo instruments are supported, no bands or orchestras. The piano mode is the most mature analysis mode. Polyphony, velocity, hand separation; our algorithm is up to 86% accurate. The guitar is a very versatile instrument. Our algorithm is trained on a large corpus of guitar labeled acoustic guitar songs. If you are playing flute, you will be very lucky with Melody Scanner. The flute mode is even able to separate flute notes from background music. A classical instrument not always coming alone. But when it does, Melody Scanner will be able to transcribe the played notes confidentally. 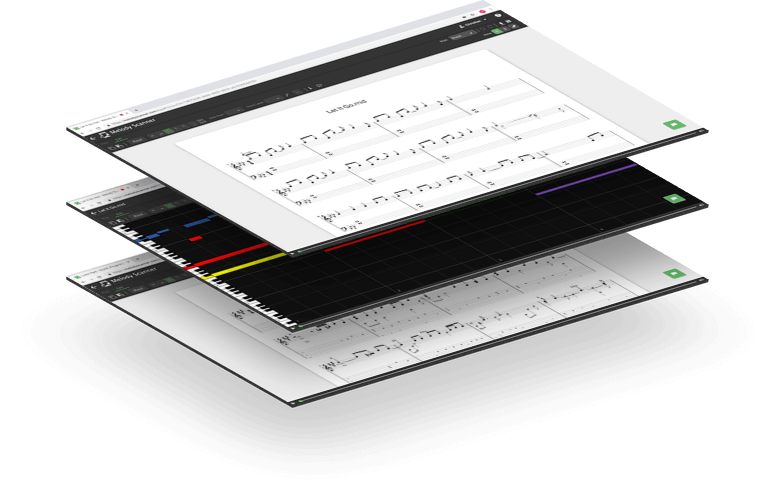 Smart tools support you editing your score. In recent years significant advances have been made in artificial intelligence. We took some insights and invented smart tools which make everyday life easier for you as a musician. Looking for a little inspiration? Let the app compose a song with you. You have the chords and Melody Scanner improvises to them. Melody Scanner is capable of applying music theory. Hence it can assist you transposing scores or help you labeling the chords. Discover Melody Scanner for free. Subscribe to make the most of it. Make someone happy by treating to Premium using a gift card! “Our team loves Melody Scanner! “I love the app so much, more than you know!! “I think it is very accurate for both guitar and piano. It really helps me understand the theory behind the songs I write. “Best music transcription app I have used. Even lets you export to MusicXML through the website. 196,791 scores have already been created using Melody Scanner! By signing up you agree to Melody Scanner's Terms of Service.